Central California is a subregion of Northern California, generally thought of as the middle third of the state, north of Southern California. It includes the northern portion of the San Joaquin Valley (which itself is the southern portion of the Central Valley, beginning at the Sacramento–San Joaquin River Delta), the Central Coast, the central hills of the California Coast Ranges, and the foothills and mountain areas of the central Sierra Nevada. Central California is considered to be west of the crest of the Sierra Nevada. (East of the Sierras is Eastern California.) The largest cities (over 50,000 population) in the region are Fresno, Bakersfield, Modesto, Salinas, Visalia, Clovis, Merced, Turlock, Madera, Tulare, Porterville, and Hanford. Central California can have widely varying definitions depending on the context. Some divide the state by lines of latitude making northern, central and southern sections. Others divide by county lines or watershed boundaries. Some definitions include more of the San Joaquin Valley and even larger portions of the Central Valley. Some have less or none of Central Coast. Area cities and towns listed below are major regional centers or county seats. Central California has opened two new universities recently, one in each of the past two decades. The University of California has one campus in the region. University of California, Merced opened on a newly constructed site on the east side of Merced in 2005. The California State University system has four campuses in the region. California State University, Monterey Bay opened on the site of the former Fort Ord army base in 1994. California State University, Stanislaus in Turlock opened in 1957. California State University, Fresno opened in 1911. The Monterey Institute of International Studies is a graduate school that offers eleven master's degree programs in international policy, international management, language teaching, and translation and interpretation. The Monterey Institute of International Studies is a graduate school of Middlebury College. San Joaquin College of Law is a private, nonprofit law school located in Clovis. Fresno Pacific University is a private university in Fresno. The Naval Postgraduate School and Defense Language Institute are located in Monterey. There are no community colleges in Madera, Mariposa or San Benito Counties. Most of the major highways in the region run north-south around the mountains. Interstate 5 and State Route 99 are the primary highways in the San Joaquin Valley. US 101 and State Route 1 are the major coastal highways. Passenger rail in the region consists of the Amtrak long-haul Coast Starlight and Amtrak California San Joaquin routes. The California High-Speed Rail system is under planning. If built, it would have stations in Fresno and Merced on the initial line between San Francisco/San Jose and Los Angeles. Freight rail is served by commercial railroads. Union Pacific Railroad and BNSF Railway operate mainline freight through the region in the Central Valley. Major and regional airline service are available at Fresno Yosemite International Airport and Monterey Regional Airport. Regional airline service is also available at Modesto City-County Airport, Merced Municipal Airport and Visalia Municipal Airport. An active military air base is at Naval Air Station Lemoore in Kings County. Variations on significant/influential definitions of the term central California are collected in this section. Fresno County's intro paragraph on its web site says its in central California. Madera County describes itself as located "in the exact center of California." Madera County Economic Development Commission describes the county as "located in the geographical center of California". Tulare County describes itself as "centrally located within the State of California". The National Register of Historic Places splits California three ways with lines across the map, with central California being approximately above Los Angeles County and below Santa Clara and Merced Counties. The California Department of Transportation, or CalTrans, has a wide definition of the central portion of the state with several multi-county districts which have "central" in the name, combining the Central Coast and Central Valley. The "North Central" district covers Sacramento to Chico. The "Central" district covers Stockton to Merced, and Yosemite. 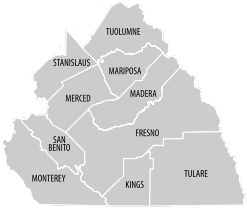 The "South Central" district covers Madera, Fresno, and Bakersfield. The "Central Coast" district covers Santa Cruz to Monterey. The Central California chapter of the Better Business Bureau defines their central California region to exclude the coastal counties and include Mono, Inyo and Kern Counties. Their definition is Fresno County, Inyo County, Kern County, Kings County, Madera County, Mariposa County, Merced County, Mono County, and Tulare County. ^ "College Listings". California Community Colleges Chancellor's Office. Archived from the original on 2010-01-21. Retrieved 2010-01-23. ^ "About the County". Fresno County, California. Archived from the original on 2011-07-18. Retrieved 2010-01-24. ^ "Madera County Statistical Information". Madera County, California. Archived from the original on 2010-01-16. Retrieved 2010-01-24. ^ "Madera County Economic Development Commission". Madera County Economic Development Commission. Retrieved 2010-01-24. ^ "About Tulare County". Tulare County, California. Archived from the original on 2010-01-10. Retrieved 2010-01-24. ^ "Map of California". National Register of Historic Places. Retrieved 2010-01-24. ^ "Highway Information Area Maps". California Department of Transportation. Retrieved 2010-01-24. ^ "Contact Us". Central California Better Business Bureau. Retrieved 2010-01-24. Metcalf, Gabriel; Terplan, Egon (12 November 2007). "The Northern California Megaregion". Urbanist. San Francisco Planning & Urban Research (466). Retrieved 2010-01-13.